The paniolo (Hawaiian cowboy/girl) culture has thrived in Hawaii for more than a century. With each passing year, greater knowledge of best management practices are used and shared to ensure ranching is done in a sustainable manner. Since HWMO’s inception, our organization has worked closely with various large and small ranches in Hawaii to assist them with fuels management expertise and funding for pre-suppression tools (helicopter dip tanks, lines to draw water closer to communities/sensitive natural areas). Our very own board president, Mark Thorne, Ph.D., is the grazing extension specialist for University of Hawaii College of Tropical and Human Resources (UH CTAHR). Dr. Clay Trauernicht talks wildfire and its relationship to climate change in the Pacific. Pablo Beimler shares about HWMO's efforts to alleviate the socioeconomic issues of wildfire in Hawaii. Morning rainbow to kick off the field tour of Kapapala Ranch. On October 27-28, Mr. Thorne and other Hawaii rangeland specialists hosted a Fall Meeting and Technical Tour in Volcano for the Society for Range Management, a “professional scientific society and conservation organization whose members are concerned with studying, conserving, managing and sustaining the varied resources of the rangelands which comprise nearly half the land in the world.” Several presentations covered topics ranging from livestock as a fuels management tool, invasive species effects on island plant communities, and climate/socioeconomic relationships with fire. Dr. Clay Trauernicht spoke on behalf of the Pacific Fire Exchange and UH CTAHR Cooperative Extension to showcase his new research on climate change’s effects on fires in the Pacific. HWMO’s very own Community Outreach Coordinator, Pablo Beimler, shed light on the socioeconomic issues of wildfire in Hawaii and what HWMO is doing to alleviate them. On the second day, Kapapala Ranch, a large ranch in Volcano, hosted a field tour through their beautiful pastures and native forests. Aside from morning rainbows, views of Kilauea crater, and clear skies, there was much to ponder and discuss in regards to proper range management in the unique climatic/topographical region that Kapapala Ranch is located in. Water storage and fire were just some of the many topics where lessons learned were shared across the regions. On the way out, a flat tire from old fencing on a dirt road made for a comical situation in which several participants, including Mr. Thorne, labored to remove the fencing remnants with all of their might as others cheered on. Just another day out in the field. The general theme that kept emerging during the event: conservation and rangeland management can and must coexist if we are to solve our growing environmental issues across the islands (and around the world). The event was dedicated to the life of Matt Stevenson, a beloved range professional we lost in 2016. His contributions to the field were tremendous. He will be missed. Native wiliwili tree at the Waikoloa Dry Forest Preserve. Hawaii’s forests are some of the most novel ecosystems in the world. A blend of native, many endemic or restricted to a certain area, and non-native plants from around the world make for complex systems and thus complex challenges. Over 97% of Hawaii’s dryland native forests have disappeared over the years, much in part due to wildfires. Scientists, foresters, non-profit organizations, community members, and others across Hawaii have made it their careers and live’s work to protect and restore the native forests that are so dear to our islands’ residents and visitors. The Western Forestry Leadership Coalition (WLFC) “is a partnership between Western state and USDA Forest Service leaders working toward the sustainable management of Western forests.” The Pacific Islands Forestry Committee (PIFC), a group that is part of the larger WFLC network, held a field tour on Hawaii Island on October 25 to visit various forest restoration sites and community projects. HWMO’s Pablo Beimler joined the field tour in the afternoon when the group visited the Waikoloa Dry Forest Preserve. The beautiful native forest preserve is a project of the Waikoloa Dry Forest Initiative, a long-time partner of HWMO. Ms. Bev Brand, a founder of the project and member of the Waikoloa Fire Management Action Committee, led the group of foresters from Hawaii, Guam, California, and other parts of the Western U.S. and Pacific through the growing forest. The topic of wildfire was brought up many times — fire is one of the greatest concerns to the preserve. In the last few years, HWMO has partnered with WDFI to create and maintain fuelbreaks to protect the rare and endangered plants of Waikoloa. Mark Gordon talks to field tour participants on behalf of Waikoloa Fire Management Action Committee. 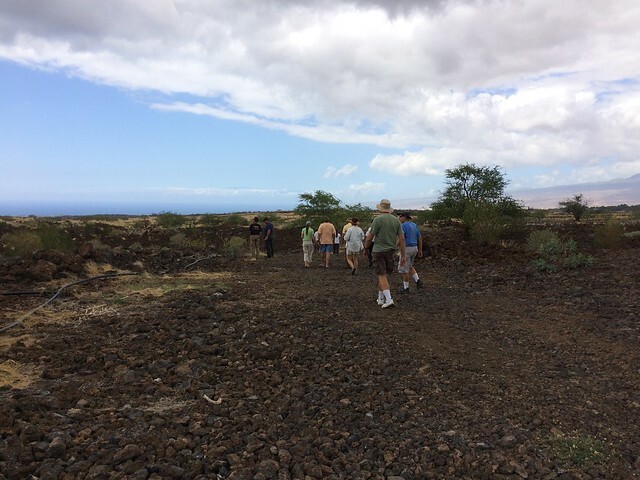 Following the dry forest preserve site visit, the group caravanned to the northeastern edge of Waikoloa Village. With a view of the vast fire fuels of South Kohala that run to the edge of homes and the community fuelbreak installed with HWMO’s assistance over a decade ago, Pablo told the history of fire management in the area. The winds blew at high speeds that day, which added not only drama, but a good teaching moment: winds are the driving factor of large wildfires in South Kohala. Pablo then passed the reigns over to Mr. Mark Gordon, HWMO Fundraising Committee member and chair of the Waikoloa Village Fire Management Action Team. Mark shared about Waikoloa’s recent efforts toward Firewise Community Recognition — as of 2016, Waikoloa Village could very well become the largest Firewise Community in the state! Mahalo to Hawaii Division of Forestry and Wildlife and Pacific Islands Forestry for inviting us to share on the field tour! HWMO assisted Waiohuli Hikina with a $5,000 grant from U.S. Forest Service WUI funds to create a fuelbreak between homes and the black wattle forest that is a potential wildfire threat. Although Upcountry Maui may not typically be known as being at risk of wildfire, more and more wildfires have threatened communities even in areas that might be considered “wet.” The El Niño-caused drought conditions early in 2016 contributed to wildfires across that state that occurred in wetter areas including in Kula. In February, a wildfire burned within the Waiohuli homestead (Kula Hawaiian Homes), prompting residents to take action. In the spring of 2016, HWMO assisted the community with a $5,000 grant from U.S. Forest Service WUI funds. With the project money, the community hired a contractor to create a wide fuelbreak behind nearly a dozen homes along the edge of a wildland area. As a next step, the community is on board for becoming a Firewise Community, joining Launiupoko and Kahikinui on Maui to become the first Maui Firewise Communities. When dry, invasive ivy and other shrubs in Waiohuli can become a wildfire hazard, threatening homes along the gulch, as seen above. As one of the first steps towards certification, HWMO’s Pablo Beimler met with Lance De Silva of DOFAW to conduct a wildfire hazard assessment for the community. Even though the area looked “green” as they drove around the neighborhood, fire was still on the mind, especially considering how fast the plants there dried out during the El Niño drought. Once HWMO puts a report together of the assessment, the Waiohuli Firewise Committee members will develop an action plan and hold a Ready, Set, Go! Workshop led by HWMO. The workshop would count as their first Firewise Event, putting them in great position to become a Firewise Community as of 2016! The crew visited a few homes to conduct "home ignition zone assessments" as part of the Firewise Community assessment report. Waikoloa Village’s new Fire Management Action Committee formed recently and is already in full swing, a big step for Waikoloa’s wildfire protection. The team, led by Chair Mark Gordon, is working with HWMO to become a nationally-recognized Firewise Community as of 2016. The certification would make the community the largest Firewise Community in the State, a challenge that the team and HWMO is willing to take on. A Waikoloa Village interior lot that the WVA recently created a fuelbreak for to protect neighboring homes. On September13th, HWMO’s Pablo Beimler (Outreach Coordinator) and Mike Tomich (Board of Director) met with the WVA’s Roger Wehrsig, DOFAW’s Jay Hatayama, HFD’s West Hawthorne and Ed Kawasaki, WDFI’s Jen Lawson, and the Action Committee’s Mr. Gordon and Wayne Awai for a wildfire hazard assessment - a requirement for Firewise Community certification. The group drove to various sites around the village to examine wildfire hazards. Sites included the community fuelbreak (HWMO’s first grant-funded project that Waikoloa Village now maintains), fuels behind the schools, a vacant lot that was grazed by a goat-dozer for fuels reduction purposes (a pilot project facilitated by HWMO and WVA), and a larger grazed area on the critical northern/mauka boundary of the community. They also visited three homes to conduct brief home ignition zone assessments to fulfill one of the requirements of the Firewise hazard assessment. Illegal green waste dumping is a major hazard in Waikoloa and is very counterproductive to the wildfire mitigation efforts being made in the village. After the assessment, HWMO will be compiling a report with recommendations for the Fire Management Action Committee to review. The Committee will discuss the recommendations and develop an action plan. Once completed, Waikoloa Village will be well on their way to Firewise certification as of 2016. Mahalo to our partners who joined the assessment and provided great input! When it comes to solving our most complex issues, it truly takes a village and the coming together of a myriad of backgrounds and expertise. PFX FIeld Tour begins at lookout on the eastern makai side of Kahikinui. 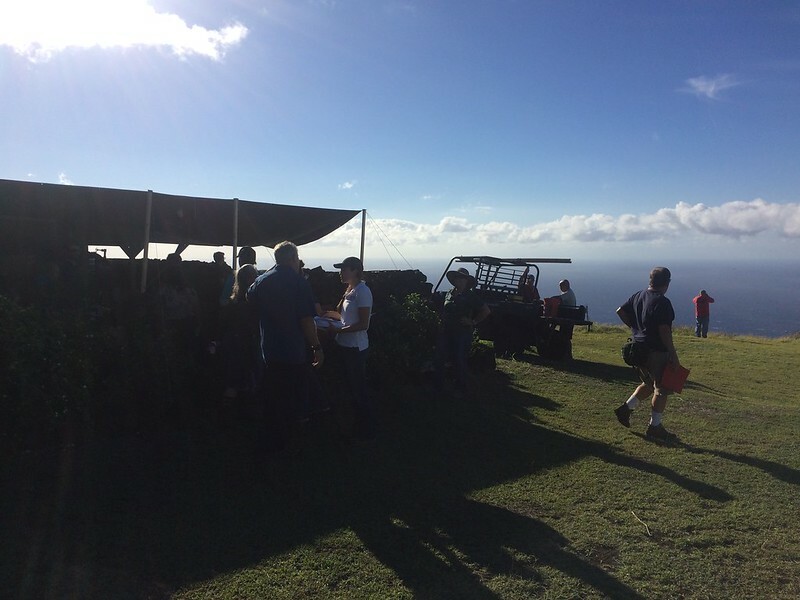 On August 29th, over 40 representatives from a number of organizations and stakeholder groups joined a field tour of Kahikinui on the southern slopes of Hāleakala. 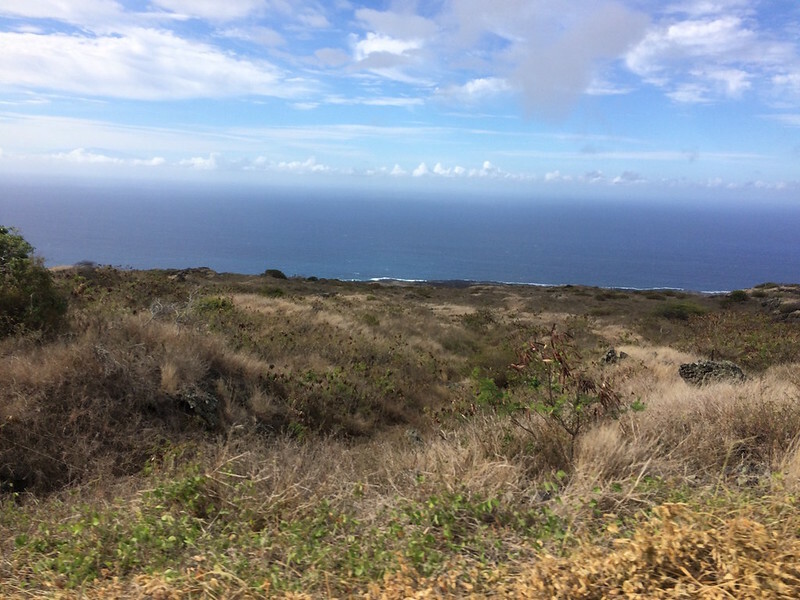 Organized by our partners from Pacific Fire Exchange and Leeward Hāleakala Watershed Restoration Partnership, the group caravanned to various sites to view the post-fire landscape that resulted from the February 2016 wildfire. The fire not only burned through native preserves and cultural sites, but also came dangerously close to homes. A few of the homesteaders of Kahikinui spoke during the field tour to share their experiences of the 2016 fire (and other fires that have given the community a scare). Throughout the field tour, there were great open discussions regarding topics from grazing for fuels reduction to increasing water access and availability to fuelbreak creation with erosion control in mind. Mahalo to Clay Trauernicht and Melissa Kunz of Pacific Fire Exchange for their great facilitation of these discussions. Big shoutout also to Andrea Buckman and the LHWRP crew for bringing in much of the stakeholder and community groups. And of course, a big mahalo to Kahikinui homesteaders who were so gracious enough to have such a large group tour their community. Also mahalo to the groups who were represented at the field tour: Auwahi Wind, Department of Hawaiian Homelands, Division of Forestry and Wildlife, Hāleakala Ranch, KOOK, Aha Moku O Kaupō, Kaupō Ranch, KGLMO, Mauʻi County Council Don Couch, Mauʻi County Fire, Find Us 911, Mauʻi County Office of Economic Development, West Mauʻi Mountains Watershed Partnership and UH College of Tropical Agriculture & Human Resources. 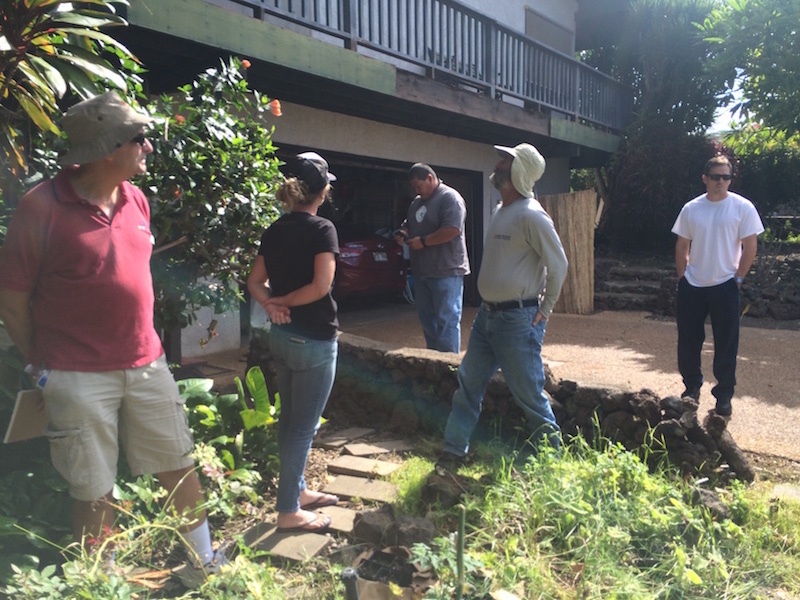 HWMO is working with Kahikinui community members to help their homestead become one of the first nationally-recognized Firewise Communities on Mauʻi, along with Waiohuli and Launiupoko. In fact, the field tour counted towards their Firewise Event requirement - they are well on their way to 2016 certification! Wildfire management in Pu'u Wa'awa'a was an important focus for many of our organization's founding board members. Now, over 16 years later, we still find the area of utmost priority and continue to build our relationship with the area's managers and nearby community members. DLNR Division of Forestry & Wildlife own and manage most of the land in the area and have been putting great effort into restoring the watershed, while also taking measures to protect critical habitat from wildfire. Edith Adkins (center) shares management maps with the group. The group prepares to examine DOFAW's fuelbreaks and priority wildfire hazard areas. DOFAW land managers tasked with protecting Pu'u Wa'awa'a's native forests invited HWMO's technical advisors to discuss and brainstorm next steps toward achieving some of the more challenging fire mitigation goals along the highway and community boundaries. 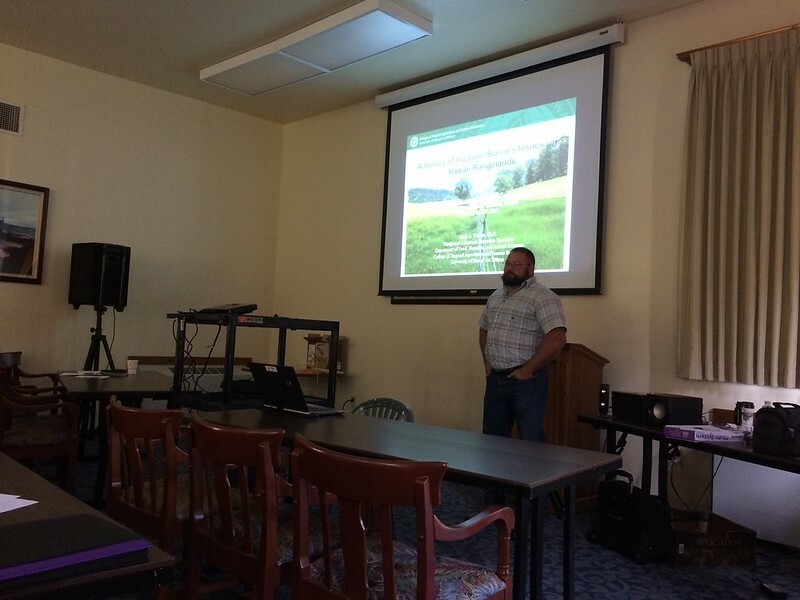 HWMO technical advisors provided their expertise in addressing the WUI-based issues in the area. Neighboring land managers from private estates were also invited to be a part of the tour. HWMO's staff, Board of Directors, and Technical Advisors with DLNR DOFAW and adjacent land managers. On July 20th, 2016, a group of HWMO staff, Board of Directors, and Technical Advisors teamed up with DOFAW representatives at the beautiful Pu'u Wa'awa'a preserve. 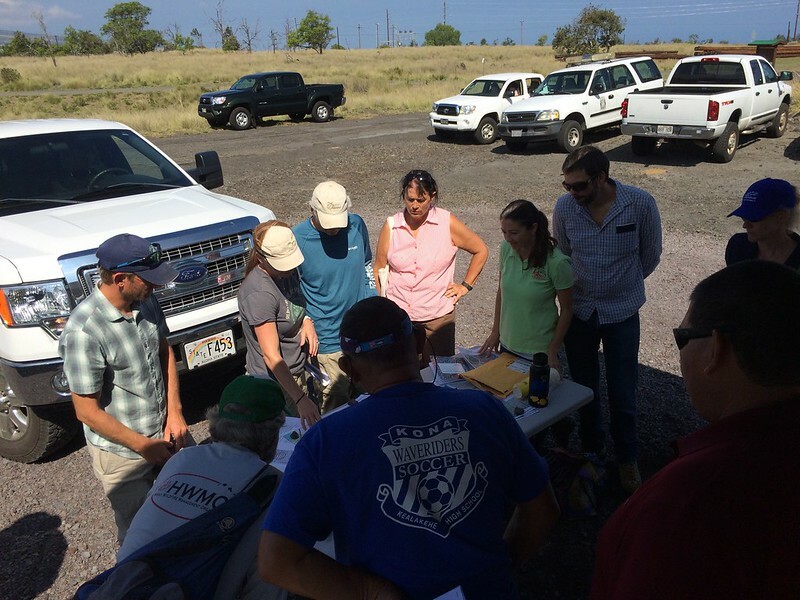 Because of HWMO’s long-standing history of wildfire management in Pu'u Wa'awa'a, our team had plenty to share in terms of lessons learned and input that will help DOFAW work towards their wildfire management goals. It was an exciting day to be out in the field and another strengthening of the invaluable bond between HWMO, its partners, and DOFAW to protect special places such as Pu'u Wa'awa'a. 20 miles, or 40 minutes, of driving distance from the nearest fire station requires a different kind of thinking when it comes to wildfire preparedness. That is exactly what Kahikinui residents on Maui constantly have in mind given they are in a very fire prone and hazardous region. Just within the past decade or so, the community has experienced 5 major wildfires, most recently in February of this year. The recent wildfire burned right to the edge of homes, scalding 5,300 acres in its path. A month later, a flareup of the fire led firefighting efforts up into the difficult-to-access mauka forests. Road access, given the topography and limited infrastructure in Kahikinui, made for a challenging firefight. Getting ready for a bumpy ride through the scorched landscape. Clay Trauernicht of UH CTAHR Cooperative Extension/PFX (middle) ground-truths wildfire intensity maps. On June 29th, Leeward Haleakala Watershed Restoration Partnership invited Pablo Beimler (HWMO), Melissa Kunz (HWMO/PFX), and Clay Trauernicht (UH Coop Extension, CTAHR) on a site visit of the recent burn. LHWRP’s Andrea Buckman and Keahi Bustamante, who have worked together in the area for numerous years, led everyone on a bumpy ride through the burned areas. What they saw was a scorched landscape from makai to up mauka that included torched fencelines, warped water tanks, toasted PVC irrigation lines, and scalded wiliwili trees. There are hundreds more wiliwili and other native plants in this biodiverse stretch of leeward Maui that the Leeward Haleakala Watershed Partnership and Kahikinui residents and businesses are working together to protect. Fenceposts, water tanks, and wiliwili trees among other infrastructure and native plants were scorched by the wildfire. Even ferns within the wetter mauka gulches were burnt to a crisp. The site visit was mostly a sneak preview for a late-July field tour PFX will host, inviting various agency and community stakeholders to join. Pablo was also able to collect initial information for the hazard assessment that HWMO will put together for Kahikinui community in their pursuit of becoming a Firewise Community this year. We met with community members after the tour and were humbled by the stories they had to share. Since the early '90s, the Hawaiian families that reclaimed DHHL land are working to revive their ancestral lands and live off the grid even in the face of the 5 major fires in the past decade or so. Their grit, perseverance, sense of community, and love for the aina will all be assets as they work to achieve Firewise Certification. 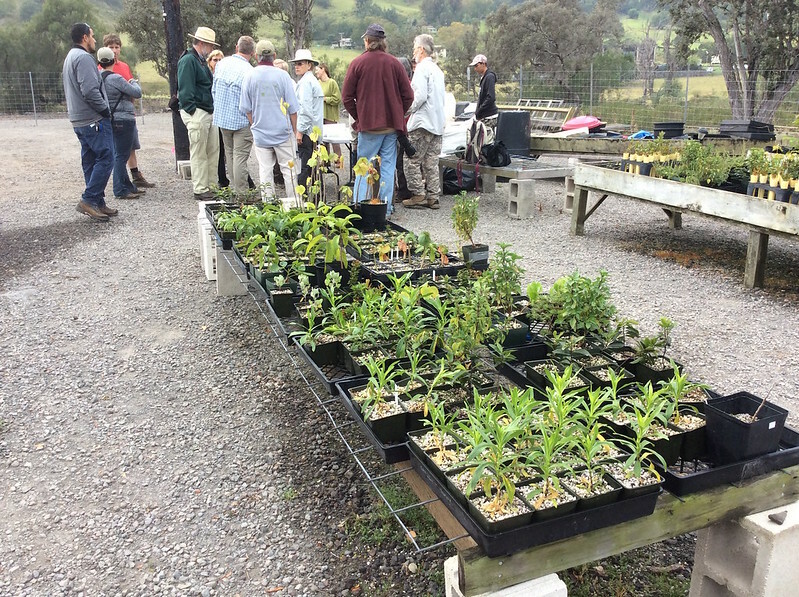 Facing the challenges with wildfires in Kahikinui will require uniting all stakeholders, from neighboring ranches to fire agencies to the watershed partnership, for the common goal of creating a Fire Adapted Community. 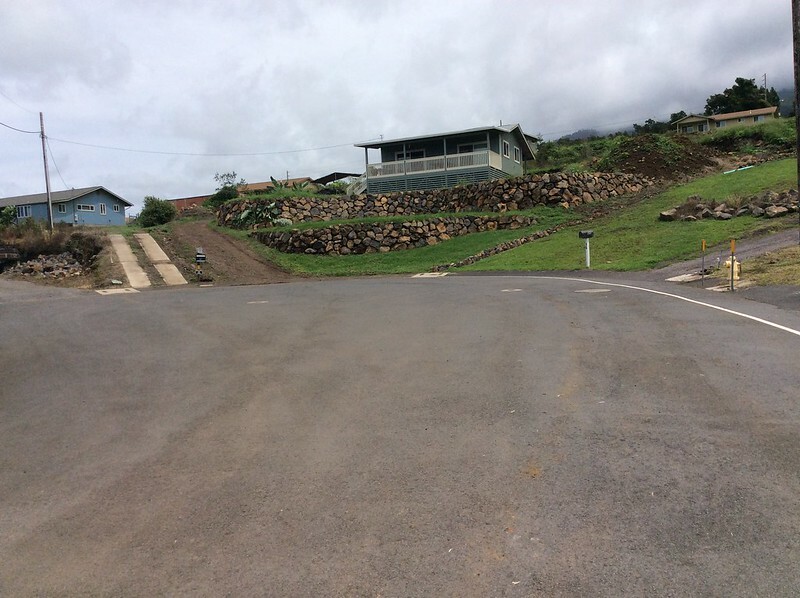 Over a decade ago, the residents of Waialea and HWMO began discussing the establishment of a living (or shaded) fuelbreak along the mauka edge of the community to increase fire protection for the homes in the subdivision. Since then, HWMO has worked on a number of projects with Waialea to ensure wildfires, which are common in the area, keep clear of their homes. In the past, wildfires have even burned down homes and structures in Waialea, something we hope will never happen again if the right measures are taken. HWMO VP Sam Patten points out charred fire post from a previous wildfire that burned right up to homes in Waialea. Waialea residents and homeowners walk along a fire access road that splits the living fuelbreak. To keep Waialea residents safe, HWMO is working with Waialea to help them become one of the next Firewise communities, a recognition that Kanehoa subdivision recently received. As a major step towards Firewise certification, HWMO’s Pablo Beimler and Sam Patten joined a group of residents (and a contractor who will be tasked with thinning the living fuelbreak with HWMO’s funding) to walk around the neighborhood and assess the community’s wildfire risk. The group began the tour by taking a look at the current state of the living fuelbreak. Within the break, there are a number of native and drought-tolerant plants that were established years ago but the area is currently in need of some thinning. HWMO will be providing a $5000 grant to Waialea to remove the flammable vegetation within the break and thin the trees to reduce ladder fuels. Keeping tree branches away from the home along the fire-free zone can make a significant difference protecting it from wildfire. We also visited a couple of homes to get a better sense for what the average home looks like in relation to the landscape. Owners of the homes took a number of precautions to make sure there was enough defensible space, including creating a fire-free zone 5 feet around the home, and that structures were fire-proofed, including using non-combustible roofing and enclosing eaves. HWMO will be working on completing the assessment over the next few weeks, which will become a useful tool for Waialea to help them determine the next steps for becoming wildfire ready. "Wildfires are the number one threat that we face," said Jen Lawson, Director of the Waikoloa Dry Forest Initiative, at the April 26th Field Tour of the Waikoloa Dry Forest for HWMO's Technical Advisory Committee members. HWMO representatives discuss options for fountain grass removal with Jen Lawson (left). 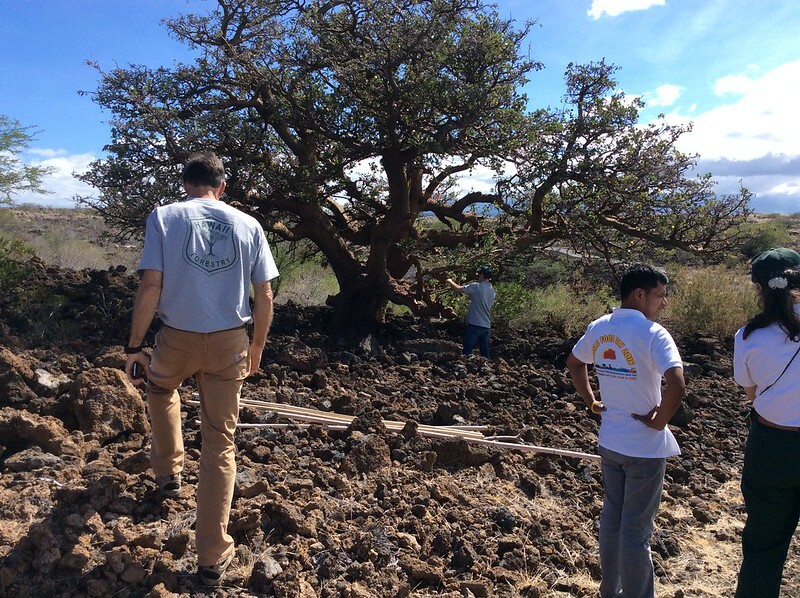 Over the years, HWMO has linked with Waikoloa Dry Forest to help preserve their incredible dry forest restoration project on the Kona side of Waikoloa Village. They protect "nearly half of the remaining kupuna (ancestral) wiliwili of the Waikoloa region", a number of critically endangered uhiuhi, among other endemic plant species. A dozen or so of HWMO's Technical Advisory Committee members joined HWMO staff and board members and Mrs. Lawson to tour the beautiful preserve. TAC members, including Chief Gantry Andrade of Hawaii Fire Department, Andy Kikuta of U.S. Fish and Wildlife Service, and Ross Williams of National Park Service offered their expertise regarding fire protection. The field tour was a great way to connect our partners in a meaningful way that will hopefully prove useful for the Waikoloa Dry Forest. We plan on having these field tours each year with different sites chosen for each one. Mahalo to everyone for joining us and sharing your expertise and mahalo to Jen for being an amazing host!